Lay out both pie crusts on a flat surface. Use a 3-inch round cookie cutter to cut 7 circles out of each pie crust. Reroll scraps to cut out two more rounds. Stir together the pie filling and bourbon to combine. Place about 1 tablespoon of the pie filling in the center of half of the pie rounds. Top with the remaining pie rounds. Gently press the edges and crimp with a fork to seal. Bake on a cookie sheet for 13-15 minutes or until lightly golden. Remove from the oven and top half of the pies with 2 slices of cheddar each. Carefully place the remaining pies on top of the cheddar-topped pies. Return to the oven for 2 minutes, watching carefully. As soon as the cheese has melted, remove pies from the oven and serve. Keep an eye on the pies in the oven once you add the cheese! The top pies have a tendency to slide off the cheese. Just use a small spatula to carefully scoot them back into place. 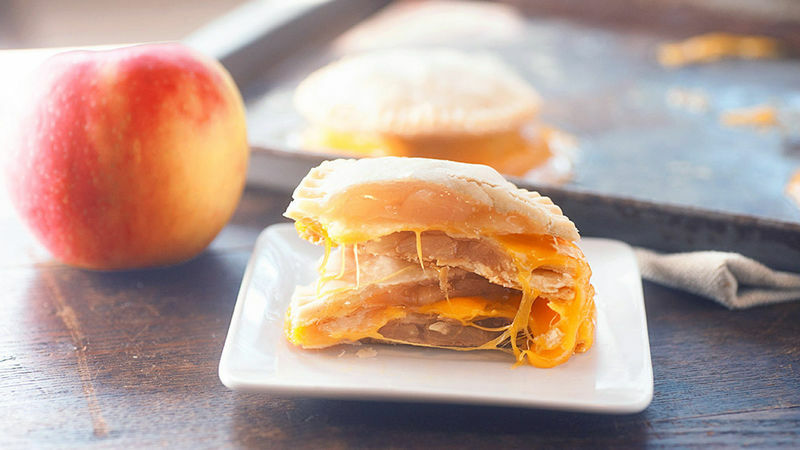 Swap your bread for apple pies and take your grilled cheese to a whole new level. Back in the day I was a server at this little family restaurant down the road from my house. I loved that job. One day a wrinkly old man came in and ordered a slice of pie with a piece of cheddar on top. I laughed, thinking he was joking, and brought him the pie, sans cheese, because who puts cheese on pie? He was like, dude. Where’s my cheese? And that's the story of how I learned that A) Apple pie and cheddar cheese are a thing, B) Don’t mess with the little old wrinkly dudes, and C) Never assume people are joking about their weirdo food requests. I now eat cheesy pie. And I wouldn’t have it any other way. So, I went ahead and turned dessert into lunch with this grilled cheese sandwich. Unless you’re a reasonable adult-like person who believes in vegetables and whatnot, and then this is still probably dessert. Let’s make this, shall we? You’re going to need one-two-three-four ingredients, one of which is not pictured because sometimes I’m a dummy. Apple pie filling from a can, because why not? Pillsbury pie crust, because that’s what we all grew up eating and it’s still just as good. Thin slices of sharp cheddar cheese, because you need cheese for a cheese sandwich. And, not pictured: Bourbon. Yesssss. Just mix that right into your apple pie filling and voila, you’ve turned canned pie filling into something extra special. Grab a 3-inch round cookie cutter and cut 7 circles out of your pie dough. Repeat with the second crust. You’ll want to re-roll the scraps to make two extra rounds, leaving you with a total of 16 little circles of heaven. Use a spoon to scoop about a tablespoon of pie dough into the center of half of the circles of dough. Break up the big chunks of apple with a spoon before scooping if your filling is big huge chunks like mine. Top with the remaining circles and use a fork to press the edges down. So pretty! So easy! I’m in love already. Pop those bad boys on a baking sheet and bake ‘em up for 13-15 minutes or until lightly golden. Top half of the pies with two slices of the cheddar. Place a second pie on top. Return to the oven for 1-2 minutes, keeping an eye on them. You just want the cheese to melt. Also, keep an eye out for sliding pies. They like to slip right off the top as the cheese melts, so just carefully bump them back where they belong. Carefully scoop the pie up off the baking sheet and serve. Cheesy apple pie perfection! Cut into that bad boy and watch the cheese ooze.